Friedrich Nietzsche (1844 -1900) is one of the most controversial figures in contemporary philosophy. A German philosopher and cultural critic who is well known for his proclamations on God, truth, morality, power, aesthetics, the self and the meaning of existence, Nietzsche has had an enduring influence on Western philosophy. Making use of a creative writing style, such as aphorisms and emotive essays, Nietzsche’s doctrines have been famously misappropriated by those seeking to further their own political ends (for example, Hitler and the alt-right). He was seen as an early existentialist because of his insistence on existence preceding essence, and the importance of looking to yourself – rather than God, society, family or friends – to identify what values you choose to live by. Nietzsche worried the society of his time and classical thinkers like Socrates and Descartes– both Rationalists – only emphasised the Apollonian, neglecting the role of the Dionysian. Nietzsche thought it was important to balance our rationality with our sensual and passionate experience of life, and he saw this balance best depicted in ancient Greek tragedies. Nietzsche insisted Greek tragedy achieves greatness through the inclusion of both Apollonian creative energy which is responsible for the dialogue, and Dionysian energy which inspires the music or chorus. In the plays, the two work together as the meaning of the words are enhanced by the accompanying melody. Using Greek dramatic artworks as an example, we can learn from great art to see the beauty in life. The tragic spectator is united with others in the shared experience of being human. For Nietzsche, life without emotion, art and the creative energy of the Dionysian is bleak. A balance between Dionysus and Apollo allows for pluralistic and authentic modes of expression that are rational as well as creative. Aesthetic ideals also appear in his later writings, such as The Will to Power (1901), where Nietzsche writes, “Art as the redemptionof the man of action… Art as the redemption of the sufferer”. Nietzsche advocated for a series of values or virtues we should adopt – namely, active, life affirming values, as opposed to the life denying or passive and ‘slave like’ values he detested. The latter he saw exemplified in the institutionalisation of Christianity, which, he believed, served to reinforce the power of the few at the expense of the many. Nietzsche emphasises an individualistic development and construction of self, summed up in the notion of the will to power. Claiming we ought to seek control over ourselves, Nietzsche holds up the Superman (yes, Nietzsche was misogynistic, but for our purposes we can extend this concept to include women), or Übermensch, as the pinnacle of human potentiality in terms of power and integrity in a broad sense of the word. This existentialist ideal – that each individual creates one’s self in a manner pleasing to them – threatens to collapse into extreme relativism or subjectivism. Yet, despite the fact the Superman goes “beyond good and evil”, Nietzsche is a moralist with definite views on what is condemnable. One way we are invited to test whether or not our chosen action is the right one is given to us in Nietzsche’s doctrine of eternal recurrence. “The Greatest Weight” in The Gay Science tells of a demon who confronts us, suggesting we must relive every single moment of our life, every choice and its consequences, eternally. We are asked whether we would celebrate this as a gift or curse the unending misery it presents. The Superman would embrace the opportunity due to their authenticity and the fact they made each choice consciously, willing to accept full responsibility for their life. Such a thought experiment offers an overly ambitious understanding of freedom and free will as a positive force. Yet it provides the reader with an interesting challenge when making decisions. Knowledge of an eternal recurrence would fundamentally change the way we lead our lives and inform the choices we make. If taken seriously, one could not help but try to act authentically – or, alternatively, not act at all. Ever the rebellious teenager of philosophy, Nietzsche continues to give us pause for much thought, challenging us to live authentically and take unflinching responsibility for our lives. 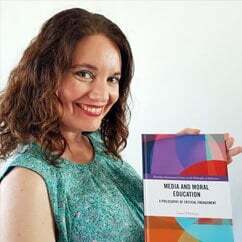 Dr Laura D’Olimpio is senior lecturer in philosophy of education at the University of Birmingham, UK, and co-edits the Journal of Philosophy in Schools. Which part of yourself do you value more: your emotive or rational side? I think I value my rational just slightly more than my emotive side. I am convinced that more positive outcomes result if one can think before acting on feelings. But, I totally agree with Nietzsche that both are equally important to a full and authentic life.